Website: Development Academy website - click here. 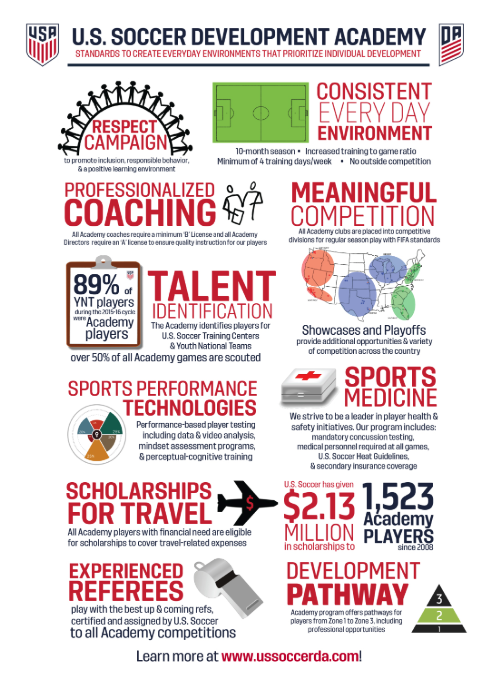 This gives a good insight into the program, expectations and structure from 12 boys through to 19 boys. The following games from this fall, have not yet been added to the Hudl exchange. If these games were played, please be sure to get this video added not only to your team pages, but to the league exchange. If you need help adding the video to the exchange, please visit the Hudl DA Resource Center. US Soccer has the opportunity for every DA 12 Boys program to have 6 Discovery Players (DP) join the team for the year in order to attend training sessions 2x per month. We are therefore going to have a DA evaluation for your son to attend if you wish. The DP program does not interfere with your commitment to your team and will not conflict with any training sessions or games. This is an additional opportunity to train with our DA players and coaching staff.